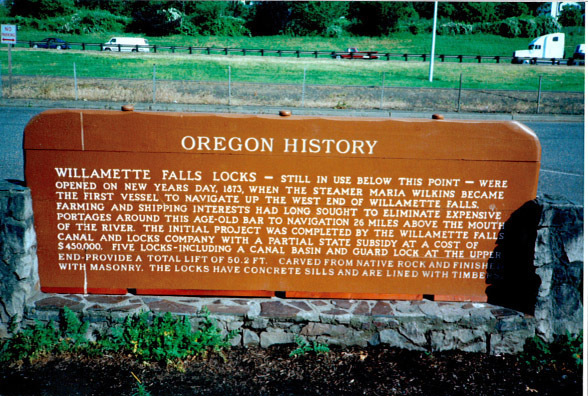 Willamette Falls Locks- still in use below this point-were opened on New Years Day, 1873, when the steamer Maria Wilkins became the first vessel to navigate up the west end of Willamette Falls. Farming and shipping interests had long sought to eliminate expensive portages around this age-old bar to navigation 26 miles above the mouth of the river. 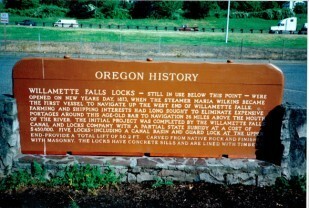 The initial project was completed by the Willamette Falls Canal and Locks Company with a partial State Subsidy at a cost of $450,000. Five locks-including a Canal Basin and Guard Lock at the upper end provide a total lift of 50.2 ft. carved from native rock and finished with masonry. The locks have concrete sills and are lined with timbers.